Blackmagic Camera Founded by CEO Grant Petty, the company manufactures equipment for video acquisition, editing, and conversion—and has offices in Europe, Asia and the United States. In 2009, it acquired Da Vinci Systems, a company that had wonEmmy Awards for film colouring and restoration equipment.In 2010, Blackmagic Design acquired Echolab, a manufacturer of vision mixers. In 2011, Blackmagic Design acquired Teranex, a manufacturer of video processingproducts.In 2012, Blackmagic Design acquired Cintel, a manufacturer of professional post-production equipment, for transcribing film into video or data formats. In 2014, Blackmagic Design announced the acquisition of eyeon Software, Inc. Creators of eyeon Fusion. At the 2012 NAB Show, the company announced the Blackmagic Cinema Camera, featuring interchangeable EF mount lenses. The 2.5K sensor allows enough oversampling for clean 1080p or 2K output and is announced to have a dynamic range of 13 stops. Due to popular demand Blackmagic Design announced (at IBC in September 2012) they would add a passive Micro-Four-Thirds (MFT) mount to their line of Cinema Cameras. This move would allow adopters to use a plethora of MFT lenses, made by Olympus and Panasonic. In addition, due to the short Flange Focal Distance of MFT, and the availability of cheap third party adapters, the user could easily adapt the camera to take most of the popular lens mounts, including Canon FD. At IBC 2014 Blackmagic Design announced a production friendly PL-Mount version of the Cinema Camera. The camera records to conventional PC 2.5″ solid state drives, in either uncompressed RAW DNG or Apple ProRes and Avid DNxHD lossy formats. Apart from a few buttons the camera is accessed via its touchscreen display. 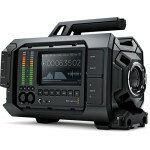 Alongside the Production Camera 4K, the company also announced the Blackmagic Pocket Cinema Camera, a highly compact camera which records to SD cards in digital Super-16 1080p RAW or ProRes, has 13 stops of dynamic range, and is compatible with active MFT mount lenses, priced at under $1,000. The camera has 12.48mmx7.02mm Super 16mm image sensor size, which is only about 36 percent of MFT sensor size, or about 70 percent of the 1″ sensor size. The camera can take video at 23.976p, 24p, 25p, 29.97p, and 30p. It has a built-in stereo mic and 3.5mm audio jack. It cannot take photos, but has a time-lapse function. The camera uses a 12.5mmx7mm sensor with a crop factor of 2.88x—smaller than Micro Four Thirds System sensor, which makes it difficult to shoot wide angle images, even with wide-angle lenses.